This course focuses on five important aspects of Word 2016 that will introduce you to the features and functionality in this software, and also help you improve your productivity. The course begins by showing you how to work with documents in Word 2016. You will learn about modifying existing templates, how to compare, combine and link documents, and be introduced to the auto recovery function. 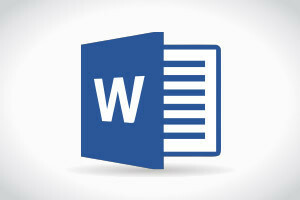 The course explains word options, how to create macros and also covers creating building blocks within your document. You will learn how to create and manage styles and how to use the auto text feature. The course then outlines how to track changes in a document, as well as inserting and tracking comments and restricting editing. You will learn how to manage document versions, inspect documents and mark them as final, along with encrypting documents with a password and managing comments. Resolving style conflicts is another subject mentioned in this course, as well as how to use wild cards, field codes and fonts. This course reviews advanced page layout options, linking text boxes, applying styles along with how to assign shortcut keys. Next, the course introduces you to key points when working with lists and hyperlinks in Word 2016 documents. You will learn how to use outline view and pre-built lists, how to define multilevel lists and work with master documents, as well as inserting hyperlinks. The course also covers topics such as how to mark entries, create an index, create table of contents, insert table of figures and create word forms. This course will be of great interest to all learners who would like to learn more about the features and functionality of Word 2016. A step-by-step demonstration of the tasks covered in the course will give you a clear understanding of the features and functionality in this software, and also help you improve your productivity. Describe how to work with documents and manage documents. Describe how to modify existing templates, and how to compare, combine and link documents. Explain how to format documents, using wild cards and using advanced page layout options. Describe how to use lists and hyperlinks within a Word document. Describe aspects of cataloging document contents.